Will Birds of Paradise only survive in dance? 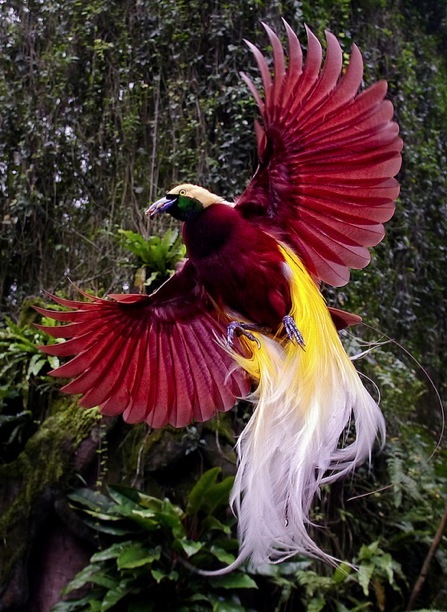 Due to their beautiful feathers various types of Birds of Paradise in Irian Jaya are now almost extinct. But also because of more recent problems, like the fact that Indonesia’s population is doubling every 30 years, deforestation, polution, overfishing and trade industry, many species of these colorful birds are now at risk (source WWF). WWF Indonesia has set up an emergency project for the Sahul region in Indonesia – from the Lesser Sundas to the North Moluccas to the West and the border with Papua New Guinea to the East – so that hopefully in the future these birds will be able to perform their quite astonishing dances again. Balinese choreographer Ni Luh Swasthi Wijaya Bandem found herself inspired by the feathers and movements of the birds of paradise during their mating ritual and created the tari Cendrawasih the the 1980’s. This dance has now become one of DwiBhumi’s most populair dances. Whenever we have the chance before we start dancing, we take some time to tell our audience about the current situation of these birds in Indonesia and about the project of WWF and other organisations that take pity to these birds, like the Cornell Ornithology Lab.